Jim Kula was born in 1947 in Manchester, New Hampshire. He entered the U.S. Air Force Academy in June 1965, and was commissioned a 2d Lt in the U.S. Air Force on June 4, 1969. Lt Kula completed Undergraduate Pilot Training and was awarded his pilot wings at Laredo AFB, Texas, in August 1970, followed by F-4 Phantom II Combat Crew Training at George AFB, California, from August 1970 to March 1971. He served as an F-4 pilot with the 335th Tactical Fighter Squadron of the 4th Tactical Fighter Wing at Seymour Johnson AFB, North Carolina, from April 1971 to April 1972, and then as an F-4 pilot with the 4th Tactical Fighter Squadron of the 366th Tactical Fighter Wing at DaNang AB, South Vietnam, and at Tahkli Royal Thai AFB, Thailand, from April 1972 until he was forced to eject over North Vietnam and was taken as a Prisoner of War on July 29, 1972. After spending 244 days in captivity, Capt Kula was released during Operation Homecoming on March 29, 1973. He was briefly hospitalized to recover from his injuries at March AFB, California, and then served as an F-4 pilot back with the 335th Tactical Fighter Squadron at Seymour Johnson AFB from March 1974 to April 1977. His next assignment was as Weapons Officer for the 23rd Tactical Fighter Squadron and then for the 52nd Tactical Fighter Wing at Spangdahlem AB, West Germany, from April 1977 to June 1979, followed by service as an instructor and air defense seminar leader with the Tactical Leadership Program at Jever AB, West Germany, from June 1979 to August 1981. Maj Kula attended Air Command and Staff College at Maxwell AFB, Alabama, from August 1981 to July 1982, and then served as a weapons and tactics inspector with the Tactical Air Command Inspector General Team at Langley AFB, Virginia, from July 1982 to July 1985. 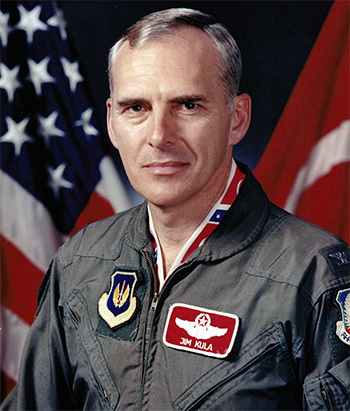 His next assignment was as Chief of Wing Inspections with the 347th Fighter Wing, and then as Commander of the 68th Tactical Fighter Squadron of the 347th Fighter Wing, and finally as Assistant Deputy Commander for Operations of the 347th Fighter Wing at Moody AFB, Georgia, from July 1985 to January 1989. Col Kula attended the NATO Defense College in Rome, Italy, from January to July 1989, and then served as Director of Assignments with the Deputy Chief of Staff for Personnel at Headquarters U.S. Air Forces in Europe at Ramstein AB, Germany, from July 1989 to July 1991. His next assignment was as Vice Commander of the 401st Fighter Wing at Aviano AB, Italy, from July 1991 to July 1992, followed by service as Vice Commander of the 39th Wing and Combined Force Air Component Commander of Combined Task Force, Operation Provide Comfort with the 7440th Composite Wing (Provisional) at Incirlik AB, Turkey, from July 1992 to April 1994. He then served as Commander of the 39th Wing as well as Combined Force Air Component Commander from April to August 1994. Col Kula next served as Team Chief, Air Combat Command Inspector General at Langley AFB from August 1994 to July 1996, followed by service as Professor of Aerospace Studies with the Air Force ROTC detachment at Embry-Riddle Aeronautical University in Prescott, Arizona, from July 1996 until his retirement from the Air Force on July 1, 1999. After retiring from the Air Force, Jim served as Dean of Students at Embry-Riddle Aeronautical University for 10 years before he and his wife Jane retired in Prescott, Arizona, where they are near their daughter Sara and her husband Gabe, and their grandson Luke. Captain James D. Kula distinguished himself by extraordinary achievement while participating in aerial flight as an Aircraft Commander near the Demilitarized Zone on 12 June 1972. On that day, Captain Kula's determination and outstanding airmanship led to the destruction of vital supplies for the opposing forces. His professionalism and superb crew coordination displayed under an extremely hazardous environment was instrumental in the success of the mission. The professional competence, aerial skill, and devotion to duty displayed by Captain Kula reflect great credit upon himself and the United States Air Force.